An entry in the diary of a British resident living on the Atlantic island of Tenerife in the Canary Islands remarked on how an afternoon tea on the veranda with her baby daughter on 9th January, 1956 was suddenly interrupted by a far-off drone. 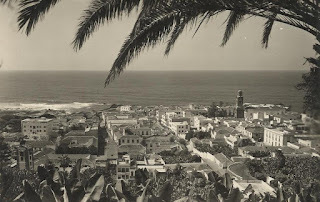 Although she was blessed to be living just above Puerto de la Cruz in the Orotava valley, a tranquil paradise where birdsong competed for attention only with the laughter and shouting of the men in the banana plantations, that sound made her shiver. Just for a second the deep humming noise reminded her of a German bomber high over her father’s farm in Kent as it headed to release bombs on the London docks during the war. She put her child down and walked to the edge of the garden to look into the sky. 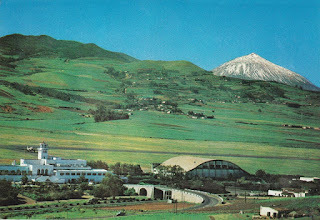 It was certainly an aeroplane but she knew it wasn’t one of the island-hopping Dakotas on its way from Los Rodeos, the old airport in Tenerife, to the landing field above Santa Cruz, the capital of the island of La Palma. As she searched in the sky the drone suddenly turned magnificently into the impressive roar of a huge sea plane and it made a triumphant low pass over the lush northern coastline of Tenerife. What she didn’t know was that her cousin Tom was a passenger on the plane and that this once in a lifetime flight over Puerto de la Cruz was the result of another of his entrepreneurial ideas. 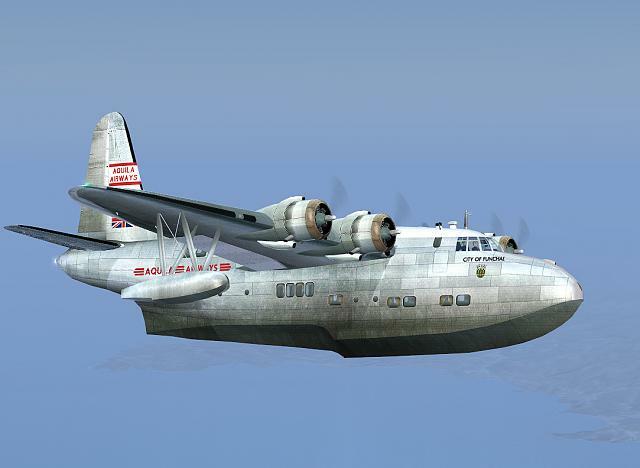 That Short Solent flying boat belonged to Aquila Airways Ltd. The company began a regular service from Southampton after its founder, Barry Aikman, bought a number of the aircraft from BOAC, which was withdrawing its fleet of sea planes. To begin with they were just used as freight carriers but they were later converted into luxury passenger aircraft for the new tourism routes. 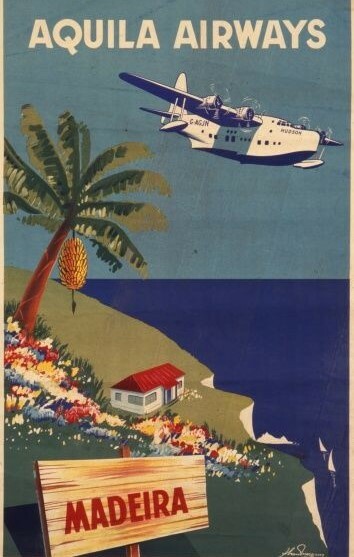 The company’s first holiday destination was Madeira via Lisbon but they later extended it to Las Palmas, on the Canary island of Gran Canaria and opened new routes to Capri, Santa Margarita and Montreux. Passengers travelled in great comfort and service a l'anglaise or “silver service” was provided during meals aboard, reflecting early days of tourism when standards were extremely high. 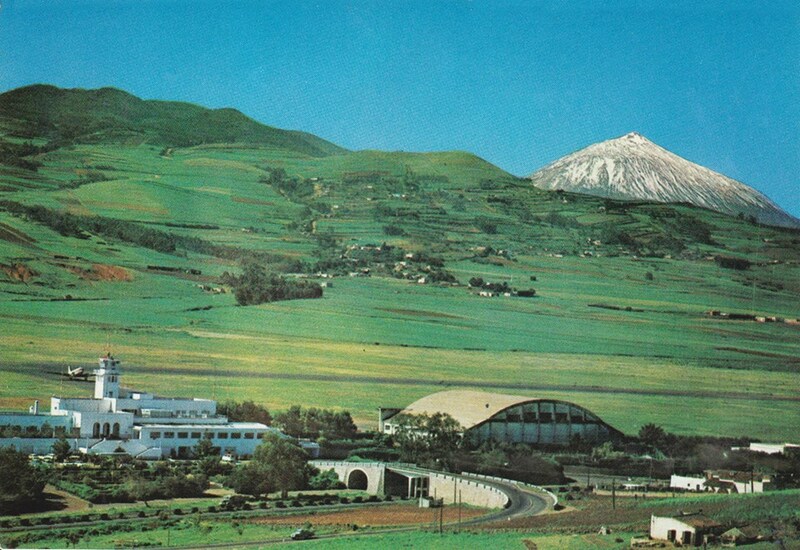 It was a time when the thoughts of attracting mass tourism to the Valley of La Orotava were beginning to take shape and the British lady’s diary seemed rather sceptical and concerned about her cousin, Tom’s ideas. He wanted Aquila Airways to fly to Tenerife as well as to Las Palmas. That is the reason he was on that Short Solent flying boat and why he had agreed with the company and pilot Jim Broadbent to make a small diversion, by flying round the coast of Tenerife before continuing on their way to Las Palmas. Naturally passengers on their way to holiday in Las Palmas were thrilled. Teide was sparkling with a fresh coat of snow and the Orotava Valley, as the flying boat passed by, was an enticing vision of paradise. Sadly the Aquila Airlines flying boats never came to Tenerife. The idea never prospered. To begin with the local authorities took their time to digest the initiative, especially as the aircraft would have to compete for space with ships in the Santa Cruz harbour and landing in the rarely calm seas off Puerto de la Cruz was simply out of the question. But tragedy marked the end of the Tenerife project. In fact, it also brought a rapid decline to Aquila Airways. Just two years after that flying boat interrupted the British lady’s afternoon tea on the veranda overlooking the colourful town of Puerto de la Cruz a Solent flying boat on its way to Las Palmas developed engine trouble after taking off from Southampton and crashed on the Isle of Wight. The crew and all 35 passengers were killed. As a result confidence in the safety of those flying boats began to falter. At the same time it became known that Aquila had begun to have difficulty finding spare parts for the aircraft. They were forced to cease flying in 1958. Coincidentally it was the same year when Jim Broadbent, who flew that magnificent aircraft past Puerto de la Cruz in January 1956, is presumed to have died. A legendary pilot who began his flying career in Australia, he started flying for a Portuguese airline called ARTOP after the demise of Aquila Airways. 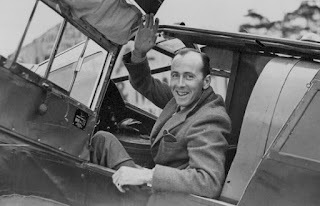 On 9th November he took off from Lisbon to Madeira in a Martin Mariner flying boat. An hour into the flight, at 13.21, a member of the crew reported they were making an emergency landing in the Atlantic. No trace of the aircraft, crew or passengers were ever found. Author of books "A SHARK IN THE BATH AND OTHER STORIES" and "THE SKIPPING VERGER AND OTHER TALES" , short stories set in Tenerife and the Canary Islands. Thank you! A lot has changed since those days but Puerto still has that certain charm.